With him is the nine-year-old shield-bearer who has been assigned to him. Day after day they wait in the valley. Goliath shouts the script that his commander has given him, and he and the boy talk. Goliath is an introspective, quiet sort, and contrary to the rumours that the boy asks him to confirm, he doesn’t eat rocks or burn things just by staring at them. In many ways, Goliath is quite childlike, and giving him a child sidekick subtly emphasizes his innocence. The shield-bearer’s loyalty and their quiet friendship is moving, and heartbreaking, because of course we as readers know the ending of this story. And that’s where a lot of the genius lies here. 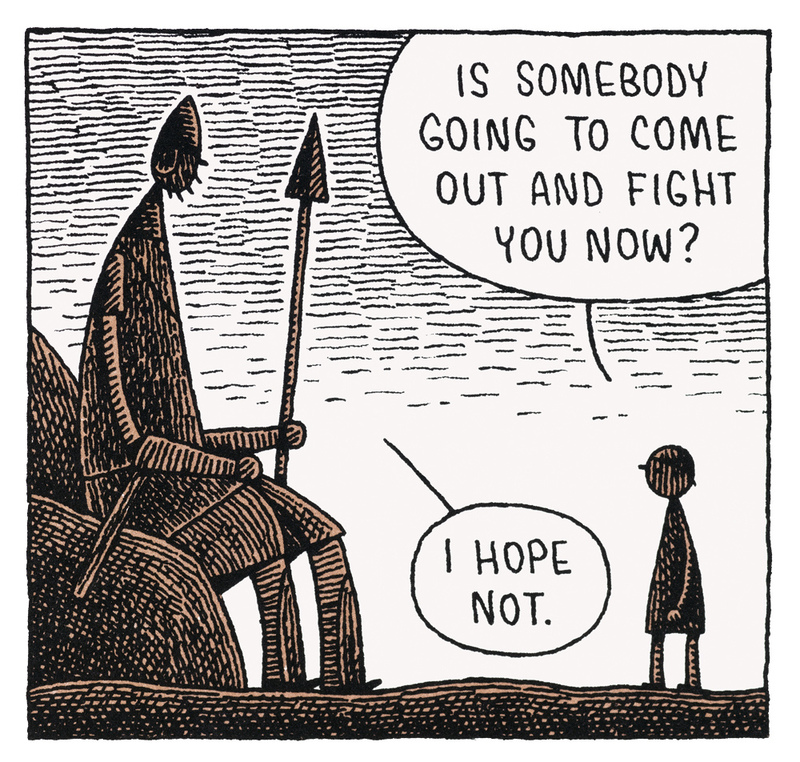 Gauld knows we know how Goliath meets his end, and he inlays his entire narrative with the tragedy of it. 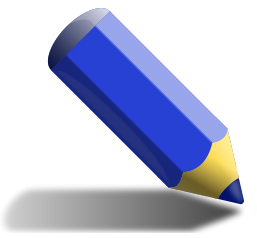 At the beginning, Goliath picks up a huge rock, which is nothing more than a pebble to him. He ponders it quietly. We know that a rock will play an important part in his story, but he doesn’t. His ceremonial armour is falling apart. 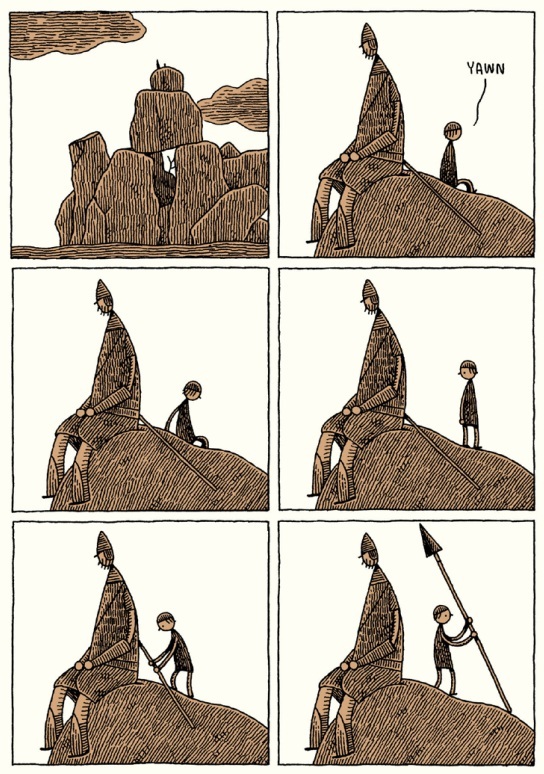 We know it’s not good news for him…the built-in foreshadowing creates a sorrowful, beautiful palette that Gauld paints on. And speaking of palettes, the warm earthy browns that form the spectrum for this story, along with the simplicity of the line drawings, are both pleasing to the eye and make for a gentle storytelling style. The choice of different typefaces to differentiate biblical quotes from day-to-day dialogue is wonderful. Gauld’s style speaks to children’s stories while addressing adult themes such as perception, bureaucracy, sacrifice, and the place of a soldier as a cog within a war machine. So much is happening beneath this quiet surface and this simple story. Much of the story takes place in the stillness of the panels, the waiting for some imminent, awful event to occur. There is a deep emotional resonance here. 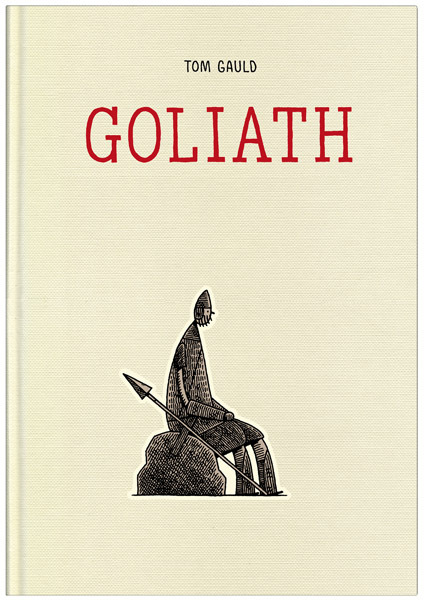 In making an utterly sympathetic Goliath and inverting the story to show David as a bloodthirsty villain, Gauld has created a timeless and timely tale. Available at the D&Q website, Amazon, Indigo, and fine independent bookstores everywhere.